The Seiko Bell Matic is one of those lesser-known vintage watches from the 60s and 70s, but it is becoming more popular. Especially since a lot of the models for sale on Ebay and the like are not of great quality. Originally produced in November 1966 of 1966, and only in Japan, this was hailed as one of the world’s first automatic wristwatches with an alarm and a central rotor. By no means the first ever mechanical watch with an alarm, it was still a model worth paying attention to. There were a number of variations and movement changes over the period these watches were made (1966 – 1978) and I will cover them in detail below. I will do my best to provide images where I can, but due to copyright reasons I may not be able to get images of many and all models. So, if you have a Bell Matic and are open to having it displayed in this guide, please get in touch. I would love to showcase your watch! The very first Bell Matic was the 4006-7000. It is quite different from a lot of the later models in a number of significant ways. First, the earlier 1966 model, which is very very (yes two verys) rare features a caseback with a distinctive dolphin emblazoned on the center of the case. It also has a notch where the alarm pusher is located. 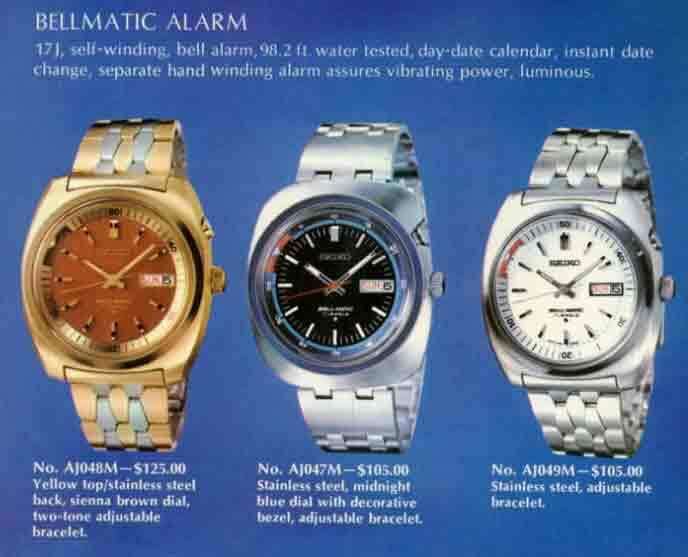 All of the earliest models have a 27 jewel 4006A automatic alarm movement. This was the highest jewel count of these movements as they subsequently started lowering them to 21 jewels, for a short time, and then the majority of the models had 17 jewels. The movement also featured a day/date function at 3 o’clock. This was different to the 4005A movement which I will show you below. There were a few dial variants of this model too, which are also very rare, including the “Diashock” dial which has this written at 6 o’clock. This dial is designated as the 7000T AD. Note:I have read that the Diashock was available on both the dolphin caseback and non, so there may be other dial designations I am not aware of. The 4005 is the alternative movement that was used in the Bell Matics, however it only had a date function, compared to the 4006 which has a day/date. It was only used by Seiko for a very short time. The best guess I can find is from this forum where it is mentioned that it was in the early Bell Matics for about 1 year from 1968. Because this movement was only available at the beginning of the Bell Matic range, it comes in the 27 Jewel variant only. In terms of dials and colors, I have seen a 7000T AD dial in white and black with stainless steel case. There is also a partially gold-plated one, with matching gold case. The final version I have seen is a bright blue one with jewels instead of rectangular hour markers – this is the 7010T dial. You can see an example of the 7000T AD in while in this video below. It shows how the alarm function works with the rotating of the crown, which in turn rotates the alarm ring on the bezel to set the alarm time. The pusher sets the alarm and can also be used as a quick-set for the date. There was a short period of time in 1967-68 where Seiko reduced the jewel count in the 4006A movement to 21. These models came in two case variants – the 7019 and 7029 (you can see images of these two in this forum post, last two images), but they are very hard to find. Some people also warn that they are often not true 21J models as the dials are often changed, so beware if you are buying one as they are rarely the real deal. If you want to see what the insides of such a 21J variant look like, this post from Richard at the Watch Spot Blog has a very detailed breakdown of a 7019 case. In 1969 as part of Seiko’s efforts to beat US customs on high-jewel watches (or so the story goes), they introduced the 17 jewel version of the Bell Matic 4006A movement. It was then used in almost all Bell Matics moving forward until the end of their production in 1978. Note: According to this forum post there were a few exceptions to this with the 7011, and 7012 models. This has been hard to 100% confirm. Another very rare edition of the Seiko Bell Matic is the so called “Business Bell”. This was the writing that is at 6 o’clock on the dial of these Bell Matics, so I guess the name is very fitting and specific. Again, these models are very rare and were only produced early on in the Bell Matic life during 1967. There are two case models for this particular Bell, the 4006-7000 (Dial 7030T) and the 4006-7010 (Dial 7040T) which you can see images of in this forum post on the topic. As you will note by the post comments, this is a very rare model indeed. Another unusual Bell Matic 4006 with 17 Jewels I have seen around is the so called “UFO” (although this nickname also gets used on other, later models too). This model has a very large and yes, UFO-like case that gives it its name. It comes in two models that I can find, the 6001 and 6002 (which is pictured here). They have a wide minute band around the outer rim of the dial along with thin raised hour marker bars. Some (like this one) come with small dots on the end (or connecting bars at 12 o’clock). Others have the more standard hour markers – thick, raised and a wider one at 12 o’clock. There seems to be a variety of colors for this watch, including this blue dial with hold alarm ring. There is also an all-black version, with red alarm marker. Prices can go as high as 300-400 on ebay.